This frontal high relief depicts an episode from the “Great Miracle of Sravasti”: the historical Buddha Shakyâmuni gives a display of his power by performing miracles before a gathering of heretical masters. Here he is represented levitating while water pours from his feet and flames flare up from his shoulders. In the palm of his right hand, raised in the abhaya mudra gesture, the lotus of the Law is carved, while the Hindu gods Indra and Brahma hold a parasol over his head as a token of reverence. The monumentality of the figure of the Enlightened One is heightened by the presence of two small flanking Buddhas, sitting in meditation and also with flames issuing from their shoulders. Beneath the latter are portrayed two classic protagonists of “Buddhist legend”: Vajrapani, the bearer of thunderbolts, and Hariti, figures which reveal a strong Greco-Roman stylistic influence. Farther down are two Iranian-style sculpted motifs, reminiscent of the decoration of Begram ivories or the decoration of Ancient Indian ceremonial chairs. Along the plinth runs a motif of eglantine foliation, a common feature in Gandhara art. This piece is typical of high reliefs from the Kapisa region.These diverge from the classicizing model of the Gandharian school by their stark frontality, a rather short and particularly massive canon, precise but stylized draping, and circular heads.This stele, discovered at the Paitava site near Begram in Afghanistan, illustrates a type of highly symbolic representation, characteristic of an art that was primarily intended to be syncretic, and that already heralded the esthetic canon of some of the sculpted effigies found in Chinese cave shrines at Yungang and Longmen, as well as the imposing scale of the Buddha at Bamiyan. 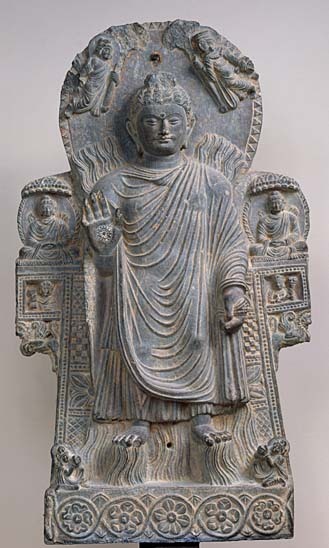 http://www.guimet.fr/wp-content/uploads/2011/10/images_musee-guimet_collections_afghanistan-pakistan_buddha_miracle.jpg 548 329 Super User http://guimet.blacko/wp-content/uploads/2017/07/logo-1.png Super User2012-01-03 13:36:332012-01-03 13:36:33"The Buddha of the Great Miracle", or "Miracle of Sravasti"